Topping the awards was Akira Samuel, who was named the tournamentâs Most Valuable Player, as well as the Best Defender on show. The Vincentian captain, however, was strongly challenged by her teammate Amolis Marshall, who was the favourite among the fans who witnessed the tournament. Two other awards came St Vincent and the Grenadinesâ way. Anesta Richards, one of the youngest players in the tournament at age 15, copped the award for Best Goalkeeper, with St Vincent and the Grenadines taking the trophy for Most Disciplined Team. 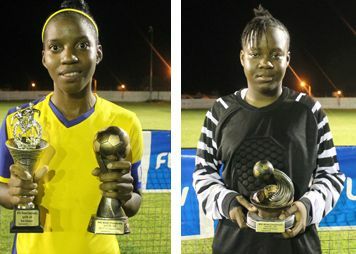 St Luciaâs captain Elliasa Marquis and Dominicaâs Aaliyah Titre, shared the awards jointly as top goal scorers. They scored two goals each. Marquis added the Best Midfielder trophy to her other award. With the inaugural womenâs tournament completed, the next focus for WIFA is the senior menâs version, set for St Lucia next month.